The Relentless Reader: The Age of Miracles..is well, pretty miraculous! The Age of Miracles..is well, pretty miraculous! 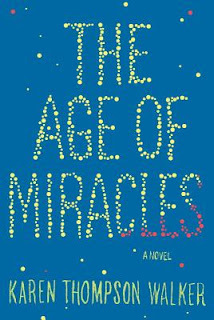 Per The Age of Miracles official site: On a seemingly ordinary Saturday in a California suburb, Julia and her family awake to discover, along with the rest of the world, that the rotation of the earth has suddenly begun to slow. The days and nights grow longer and longer, gravity is affected, the environment is thrown into disarray. Yet as she struggles to navigate an ever-shifting landscape, Julia is also coping with the normal disasters of everyday life—the fissures in her parents’ marriage, the loss of old friends, the hopeful anguish of first love, the bizarre behavior of her grandfather who, convinced of a government conspiracy, spends his days obsessively cataloging his possessions. As Julia adjusts to the new normal, the slowing inexorably continues. Oooh, 269 pages of goodness! Poor Julia, as if life isn't confusing enough when you are a adolescent girl. Then the earth suddenly goes out of whack and almost nothing remains the same. People are scared, people are sick and people are doing things they never would have before "the slowing". I would have adored the story of this girl even without the environmental disaster happening around her. But it's so believable. So believable in fact, that it's a bit scary. I found myself wondering, WHAT IF?? I should mention that it doesn't read at all preachy, I never got the impression that the author was trying to make a giant point or hit me over the head with the hammer of environmental righteousness. A simple, lovely, sad & hopeful read. Another book that sounds good. Some the best science fiction/fanciful stories center on realistic everyday people dealing in a believable way with unusual and far out scenarios.